This stylish variation of the standard pirate tricorn hat is certain to make your crew's blood run cold. 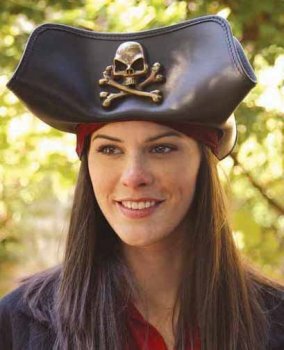 This fine black leather hat has an antiqued brass skull and crossbones emblazoned on the front, so there will be no mistaking you for anything else but a true buccaneer. Suitable for men or women. Sizes S/M or L/XL.